Sophia Fabiilli’s latest play was meant to be the season closer at the Storefront Theatre. That fun and useful venue was closed and now Liars at a Funeral has found a new home at St. Vladimir’s Theatre. Fabiilli’s play comes across as two very different sorts of comedy that have been duct-taped together. One play is a Canadian riff on the raucous British farce with hoaxes, hidden identities and caricatures for characters. 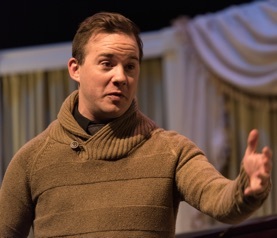 The other is a much more subtle play in the mode of Chekhov about acknowledging imperfection, forgiveness and the irony of trying be authentic in an unsympathetic world. Since Fabiilli is much more successful in the the second form of comedy, one wonders whether she should rethink the play’s farcical set-up that militates against serious comedy. The action is set in a small town in Northern Ontario about a six-hour drive from both Montreal and Toronto. The family of the seventysomething matriarch Mavis (Terry Tweed) have gathered for her funeral at a funeral home run by owner Leorah (Rhea Akler) and her assistant Quint (Danny Pagett). There has been what Leorah calls a “death drought” in the region lately, so she is overjoyed to have some business. We first meet Mavis’s one surviving daughter Evelyn (also Akler), who has come out as a lesbian to everyone except her family, and Frank (John Healy), a gay man who is supposed to play the part of Evelyn’s boyfriend at the funeral. Evelyn had been married to Bruce (also Healy) and was shocked when he chose as his second wife Sheila, Evelyn’s now deceased identical twin sister. Evelyn and Bruce are the parents of identical twin sisters DeeDee and Mia (both are played by Ruby Joy). The two sisters have not spoken to each other for 11 years because of some unutterably terrible event that happened when they were both seventeen. While DeeDee is withdrawn and socially awkward, Mia is almost arrogantly confident, pregnant with twins and married to Cam (also Pagett), a man who worked on the help line for Bell Canada. 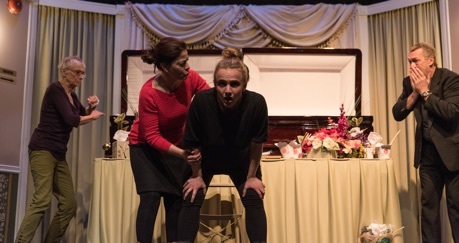 As we find out early in the play, Grandma Mavis, very much alive and well, has staged her own funeral with the purpose of breaking the family “curse” of twin sisters, like daughters Evelyn and Sheila or granddaughters DeeDee and Mia, who fall out and never speak to each other. DeeDee who lives with Mavis, and Quint who obviously has eyes for DeeDee, are the only ones who know Mavis’s plan. With three sets of identical twins, one seen and two spoken of, one might think that Fabiilli’s model was Shakespeare’s play A Comedy of Errors with its two sets of identical twins. Strangely enough, however, Fabiilli keeps trying to relate the action in Liars to Hamlet. She does this because the reason for the falling out between DeeDee and Mia has to do with suicide. It is often assumed, as in Laurence Olivier’s famous film of Hamlet (1948), that Hamlet’s grief has driven him to the brink of suicide. In fact, Hamlet the intellectual contemplates the idea of suicide in his “To be or not to be speech” rather than whether he should undertake it himself. Hamlet’s difficulty is in taking action and committing suicide is itself a form of action. Fabiilli mentions identical twins frequently but never lets us know why she has made them such a dominant theme. DeeDee and Mia are so different in personality and action their twinship seems unimportant. Fabiilli also neglects the effect of having four of the actors play double roles. In all four cases the actor plays one character who is withdrawn and other who is outgoing and all four distinguish the two very clearly. The one role that is not clear is that of Mavis. Is she eccentric, crazy or just very sensible? Getting all the family together is no guarantee that they will reconcile their differences. They could simply continue to be at each others throats. Terry Tweed does her best to make sense of the part but we leave feeling we have never really got to know Mavis. Fabiilli has information to explain why Mavis has played such an extreme prank to get her family together, but it comes so late in the play we have no time to contemplate it. pee, an excuse she seems to forget when she gets into a long conversation with another character. Later, when she pops open the coffin lid, only some of the characters and none of the audience is surprised. Similarly, Fabiilli starts out the play with Evelyn having Frank act as her “boyfriend”, but the family sees through her ruse as soon as they see him. In fact, Frank is a character who has no real function in the play. Fabiilli sets up Leorah as a man-hungry woman who seeks to get Bruce in bed (again), but nothing comes of it. The main question of the play is how DeeDee and Mia will ever reconcile, but they do and Fabiilli gives us no clear reason why they do. Despite these difficulties, director Ali Joy Richardson has drawn strong performances from the entire cast. Ruby Joy’s DeeDee is the most fully realized character of the play. Even in silence, Joy intimates there is deep turmoil inside the shy young woman. Danny Pagett’s expert comic timing is evident in both his roles as Cam and Quint. Fortunately, Fabiilli allows Quint to grow in the second act beyond the awkward, mousy assistant who scuttles about the funeral home into a deeper character. And Danny follows Fabiilli perfectly when she takes Quint into more serious territory. The two best scenes in the play have nothing to do with the play’s farcical beginning and poorly motivated entrances and exits. They both focus on subtle changes of character. In one, a very drunk Bruce mistakes Evelyn for his deceased wife Sheila. Akler and Healy play this scene beautifully as Bruce asks for forgiveness and Evelyn, taking advantage of Bruce’s mistake, allows herself to forgive him. The other lovely scene is the reconciliation between DeeDee and Mia. Fabiilli does not tell us how this comes about, but Joy’s performance in moving from fear of rejection to pleasure at acceptance is wonderful to watch. 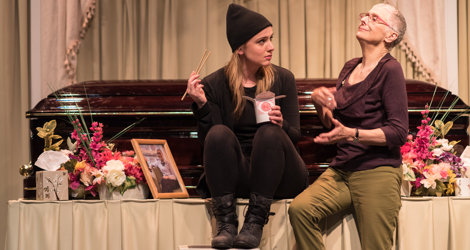 Though Fabiilli ruins the mood by a return to satire in the play’s last moments, it seems clear that she should explore her gift for sensitive comedy of character rather than trickery-laden, not-always successful satiric farce. There is great potential for a stronger and deeper play in Liars at a Funeral that I hope Fabiilli will explore further. Photos: (from top) Ruby Joy as DeeDee and Terry Tweed as Mavis; Terry Tweed as Mavis, Rhea Akler as Evelyn, Ruby Joy as Mia and John Healy as Bruce; Danny Pagett as Cam. ©2017 Neil Silcox.